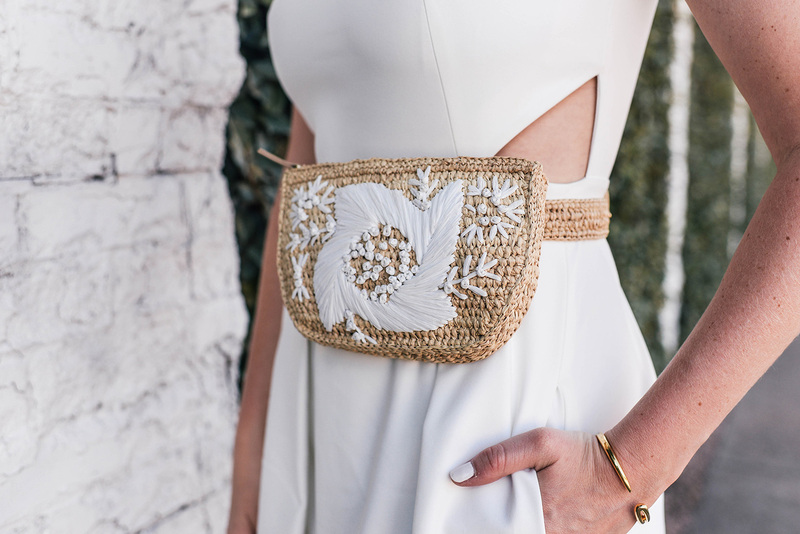 If you’ve followed for awhile, you know I’ve mentioned this little raffia belt bag before. I am OBSESSED. This may be the first time you’ve seen it here, but I’ve already worn it SO MUCH! Not only is it a practical accessory (it is a fanny pack, after all), but the straw silhouette, embroidered detail and flattering, waist-defining look make it a must-have for any summer wardrobe. I’ve worn it over little white dresses and jumpsuits like this, tied into high-waisted shorts (that look, coming soon), and so much more. I even wore it to the Byron Nelson in Dallas a few weeks back! Needless to say, it’s been a useful accessory that’s tied together some of my favorite summer looks. I may or may not have purchased this dress before my trip… so dreamy! Loving the floral print on this one-piece!! Y’all know I wear a bunch of off-shoulder silhouettes… this one should be next on your list! The fact that the name of this dress includes the word “floating”, means you know it’s breezy and effortless. This number is an absolute splurge, but in my opinion it is totally worth it. Amazing! PS – my white jumpsuit is ON SALE! Don’t wait to shop! Make Fanny Packs Great Again! Seriously though.